It was turning dark and we spotted a couple of young rats looking to see what pickings the tourists had left behind during the day on the boating lake. We were watching with interest when one of the rats spotted us and ran into the other rat causing a chain reaction. 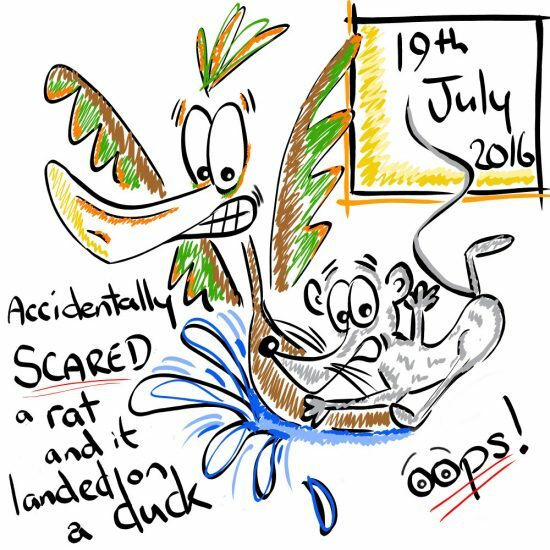 Without looking the startled rat jumped into the water, but instead of swimming off, making a flawless get away – it threw itself onto a duck! The duck was surprised and so was his mate who started to panic to. The little rat got caught up in the fray and was stuck in the middle of two madly flapping ducks on the water. Then the little rat got it’s chance! she climbed onto one of the ducks backs and jump back onto land.